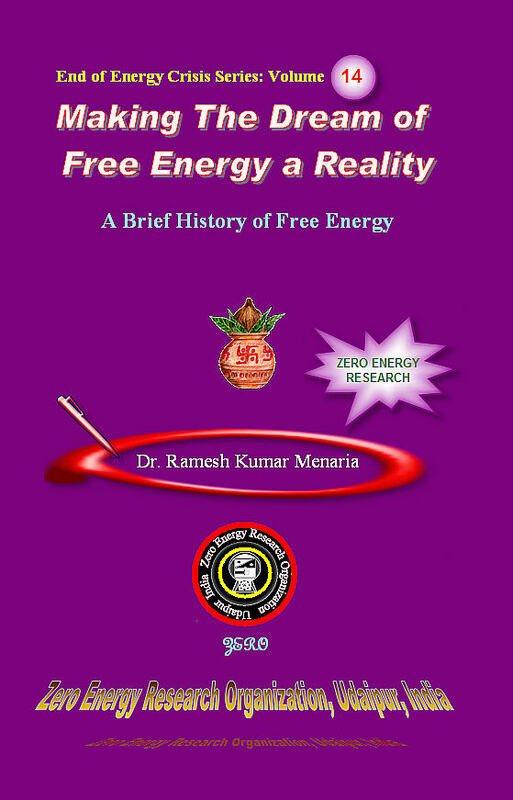 ....This volume presents a brief survey of free energy devices claimed to have been invented after 1900 as our last part of our perpetual motion history which would be largely incomplete without a brief knowledge of what is going into free energy circle. There has been a revived energy revolution movement going on around the world the past 20 years that has not been covered or reported by mainstream press, establishment scientific journals or university research publications. Besides learning new methods of energy generation, perpetual motionist has now learned that law of conservation of energy has a status of religion in physics. He has learned to respect the faith of physicist although physicist has always subjected perpetual motionist like a football. I really think it is really unfair to come down on them so hard. Bitter experience has taught them that in order to save their neck from physicist and avoid any trouble in patent office; it is not wise to declare any violation of law of conservation of energy while filing the patent of perpetual motion or free energy, no matter, even if the law of conservation of energy gets violated in working of device. In present times, inventors are getting more energy out of the system than the energy that they are putting into the system which they generally call Free energy. What that external source is, may be a tough question to grapple with. A machine has over-unity effect when it produces free energy, i.e., when its efficiency is “over unity.” They have come to a better explanation i.e. the excess energy is being accessed from as yet not completely explained source. It is mind blowing that most (though not all) now admit their machines are using “space energy”, “vacuum Energy” or “aether energy” usually via new theories of physics that physicists don’t grasp yet. Perpetual motionists have changed their technologies keeping in line with recent developments in science and technology. Over balancing wheel is largely now in oblivion; though its new form “gravity Motor” is occasionally claimed to have been invented in modern times also. Today’s free-energy panorama encompasses a puzzling vast number of devices .Using terms like “serendipitous transformations,” “paradigm shifts” and “energy revolution” Kaplan, one of leader in free energy circles mentions a variety of over unity devices that, he claims, are infinite and exist virtually everywhere. Not only are these energy sources everywhere, Kaplan emphasize, they are low-cost, clean, reliable and safe. Even more significantly, they apparently contradict laws of physics by generating great amounts of energy from a small fuel source. Besides, solar, wind and geothermal power, Contrary to the old perpetual motionist who always guarded his top secrets, free energy enthusiasts are now willing to share their knowledge in service of science and general welfare of mankind. In laboratories, all over the world exciting research is being conducted on new sources of energy that will allow them to end our dependence on fossil fuels and nuclear power. There are now prestigious journals, magazines seminars and proceedings in free energy like the main stream science technology. Their job is to get more accurate and complete information for the benefit of the public and the media about the new developments in energy. But within free energy community progress is not same everywhere. Few are just at a beginning, few in the middle phase. Few organizations, as they claim, have succeeded far greater than their fellow departments. An attempt has been made to collect information from various websites regarding what progress has been made in new energy research and related research on new ways to produce low cost energy. Perpetual motionists and free energy enthusiasts are largely scattered in India and still waiting for establishment of a network for exchange of ideas. On the other hand, in America and Europe the process of study of gravity motor and other new free energy technologies in alternative power is developing at faster pace. Besides secret programs and institutes, it is possible to make a conclusion that activity of this work in countries of limited fuel resources is likely to be more efficient in future. Now India is relying on development of nuclear energy but in the short time this strategy is not going to play any major role in development of economy. We are developing country. We are not making such as success of our economy that we can afford to ignore perpetual motion. Industrial and defense power of any country will depend on perpetual motion and other free energy technologies, knowledge on the biologically active energy and reactionless propulsion methods. The development of perpetual motion is the surest strategy to put India ahead by 2020 as realized by reverend ex president Abdul kalam. Gravity is whole and sole answer to the world’s need of new sources of energy. Other sources in coming 21-30 years will certainly have dwindling status as increased use of gravity will gradually replace them. It is expected in very short time Gravity will become almost the sole means of bulk power generation. Since harnessing gravity coast nothing, it will be equally received by developing nation as well as developed nation on a large scale. It will accelerate pace of progress in developing countries. It will enormously help to bring the standard of living of people in developed countries. Gravity is the energy source that will feel energy gap that will profit everybody - laborer, housewives, scientist, engineers Industrialist, businessmen and farmer. The free energy technology like perpetual motion promises not only new technical systems but also new economical systems. It is entirely a matter of decision and policy making. Development of free energy technologies for home and commercial application is the way to change world economical balance in favor of India. It is difficult to say now whether financial-economical groups of modern India are interested in development of science and technology in this direction. The purpose of any financial-economical group is power on the market of energy resources, but when the free energy technologies are developing, then people and industrial or agricultural producers will be more independent from centralized system of energy and oil distribution, therefore, they will be more independent from influences of central authorities. From the point of view of serious business, leading business houses are yet largely ignorant about miscellaneous free energy technology and their sustainability. There is only one real argument in favor of developments of any really new technology: shortest time needed for research, development and commercialization prior to an innovation. it should lead to increase of profit and expansion of the market. In this sense, it is possible to compare the free energy technologies with beginning of the nuclear energy or steam machine age or with appearance of electric machines and illumination. A single example will suffice. For example the beginning of atomic energy can be treated in the work of Rutherford in 1922. Fermi’s work on chain reaction may be taken as indicating the beginning of the engineering work. if we take the first practical working fission reactors as having begun functioning in 1953 and regard this as the beginning of Commercialization than we get 1988 as the beginning of the general innovation of atomic energy. But this long time span of invention and marketing of technology does not apply to perpetual motion, being simple in mechanism and availability of free cost gravity everywhere, therefore, gravity based free energy development will be rapid. This means the super profits and no fight with competitors. However, to develop this way any efforts of perpetual motionists are not sufficient work. For long, he has marched alone, now it is time and necessity to join them with the efforts of large business structures, which are interested to create new market of energy and power engineering in parallel to present monopoly fuel-energy market. My own vision of perpetual motion enables me to predict that time will come when the fuel driven vehicles will be obsolete and that most of their functions will be performed by perpetual motion. I have strong hope that such progress will take place in the first two decades of 21st century. Perpetual motion opens a new era of human progress in every field. In space, we will be able to transcend the boundaries of our solar system and venture out into intergalactic space. But even on this earth, the possibilities of perpetual motion science are as unbounded as space itself. Time is not far when commercial exploration of space by means of new propulsion principles will be possible. In particular, telecommunication space satellites and projects on colonization of space would be a reality with commercial potential of the new market. I want to make it amply clear - leaving no scope for misunderstanding. As such most categorically I have nothing to do with validity of the claims of perpetual Motion Machines or Free Energy Devices mentioned here in this volume. These devices are untested and I make no guarantee that they will work. They simply represent their best thinking to date and like Deva Ramananda I am not looking for outside inspiration and duplication. Author has no desire to criticize these attempts of free energy for any shortcoming of theirs. Even most bogus claim he would not consider as a waste of time. These claims are a valuable record. For one thing, they tell us what people think about at the turn-of-the-century. They also tell us something that even main stream scientist does not know. They tell us that you have to be ready to fail fifty times if you want to succeed once. Besides, brief history of free energy devices, issue of suppression and cases of suppression have been discussed. It is hoped that readers will exercise their own judgments to support a particular free energy technology and participate in free energy movement to emancipate world from energy crisis. In the end, I would like to quote inspiring message of Patrick G. Bailey, a pioneer in free energy field. He beautifully remarks. “If ignorance was a good enough reason to not try, the light bulb would have never been invented and Earth would still be flat. Let us be judged by our work and repeatable results, and not by hasty words. If some of these works turn out to be not valid, so be it, let it be known, and let’s move forward with integrity! We all are desperately looking for the next big break through in perpetual motion to assist us in solving the escalating energy and environmental crisis! Do something to promote and encourage the continuation of these researchers and these works. If you don’t do it, who will? If not now, when?”….. Method and Apparatus for Accumulating and Transforming Ether Electric Energy. How DePalma invented his machine? Norwegian Sculptor Invents “Moving Sculpture”.